Each functional textile is uniquely designed and created meticulously by hand to meet each client’s specifications and aesthetic, with careful attention given to matching the right artist to each particular installation. One-of-a-Kind Functional Art Each functional textile is uniquely designed and created meticulously by hand to meet each client’s specifications and aesthetic, with careful attention given to matching the right artist to each particular installation. Network of Fiber Artists Wander Design’s Collective is a growing network of fiber artists from across the Globe. Wander Designs creates custom functional art piece for your home, handcrafted by artisanal weavers and dyeing specialists using sustainable fibers and plant-based pigments. functional textiles, ranging from window treatments to furniture upholstery and lighting. Sarah Neubert, a master weaver and educator, is a fiber artist who creates wearable art, wall hangings and objects for the home, elevating functional items for everyday use into the realm of the beautiful. Her approach takes its inspiration from nature, using natural yarns and fiber, including hemp, cotton, silk and wool, that are organically grown, often repurposed, and always sustainable. Katrina contacted Sarah after seeing one of her woven necklaces on Instagram, which led to a collaboration between the two. The result, a functional woven window art installation for a home in Austin, TX, composed of wool, hemp and cotton boucle, reflects Wander Designs’ philosophy that artwork can be useable. Beth McTear, a natural dye artist, is the principal of Honest Alchemy, a sustainable textile and accessory design company that uses 100% natural fibers. With an emphasis on creating utilitarian art for the everyday, she uses all-natural dyestuffs sourced from reputable fair-trade resources, as well as from her own dye garden and from foraging materials in her community. 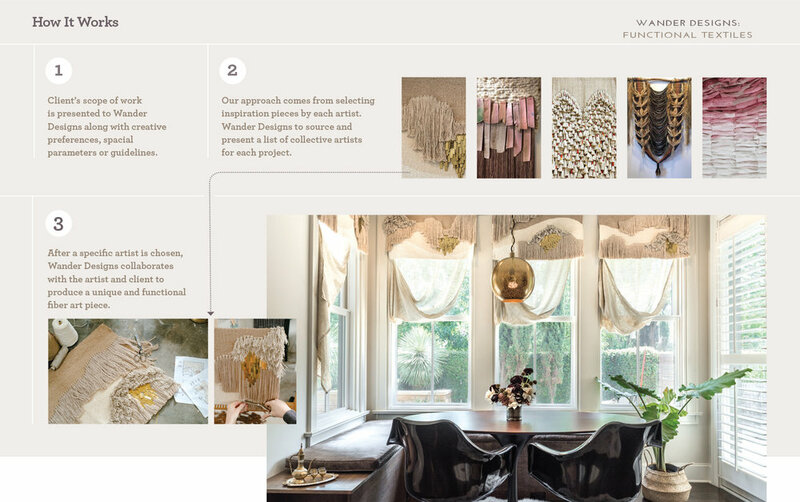 After seeing an eco-dyed skirt at a local textile event, Katrina became intrigued by the idea of incorporating the technique into her interior design work. After doing some research online, her search led to Beth. This resulted in another artistic collaboration: the two created a pattern and color palette for window drapery in an Austin home. The linen drapes, eco-dyed with rust and eucalyptus leaves, are a testament to the everyday application of fiber art. All work is handcrafted and unique, produced on a custom basis using natural pigments and dyeing techniques. As a result, lead time is 4 – 6 months. At Wander Designs, we embrace nature’s beauty and welcome its inherent diversity, so variation in color matching can be expected.